By using VWO, you can now add visitor behavior as a condition for your visitor segments. Behavior targeting allows you to execute a test only when your website visitors perform an action on the webpage, such as clicking the Product Demo button or “after scrolling 50% of the page.” In such cases, the visitors are eligible for a test after they meet the behavior condition you specified for the test. To view the list of all behavior targeting conditions you can add, click here. By default, most A/B tests run when the page gets loaded. However, if you add a behavior action, the tests run only after users perform the defined behavior action on the page. 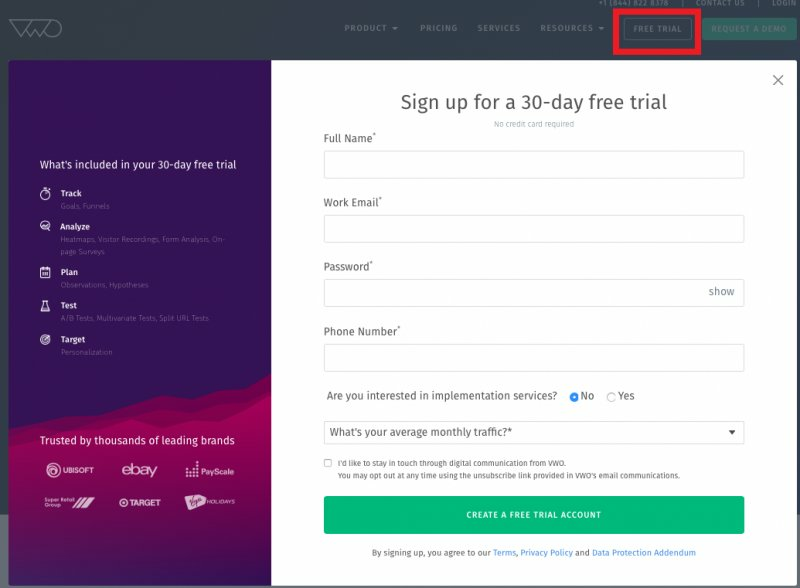 Example: Consider that we want to test the free-trial form on VWO.com. On the website, visitors can access the form by clicking Free Trial. For the test, we need to add trust badges on the left side of the form and measure the impact on the number of sign-ups. Precise targeting – If you just define visitor segments by using a URL, all visitors landing on the URL will become a part of the test. However, not every visitor will click Free Trial. By adding in-session behavior, you can target visitors landing on the page and then clicking the button. This will help you narrow down the scope of the segment. Accurate test results – Adding the in-session behavior condition ensures that only visitors who perform the defined action become a part of the test segment (after clicking the free-trial button in our example). This step ensures that your decisions and changes to the websites are data-driven and based on accurate statistics. Say your hypothesis states that showing promo codes to returning visitors on your website who have not made any purchase will increase the checkout rate. For this visitor segment, you may want to display the promo code when they are trying to close the website. Consider that your website already displays a pop-up for email subscription when users try to exit the website. For this hypothesis, you need to test a variation that displays the promo code instead of the email subscription pop-up to a specific visitor segment. To make sure that accurate data is collected and relevant content is displayed for the visitor, add the visitor behavior about trying to close the page to the variable that identifies visitors who have not made any purchase on the website. When creating the test or visitor research, enable the targeting option by selecting the Segmentation check-box. In the segment box, select the Custom tab. Using the drop-down menu, go to the Behavior category, and then select a behavior you want to track. To learn about the different conditions in the Behavior category, click here.